This was my first 4 color business card, created back in the 1980’s, when I relocated my studio from my home in Oak Park, to a studio space in Chicago, on North Wells Street, just south of Chicago Avenue. This illustration was done on yellow tracing paper, using sepia ink in a Rapid-o-graph ink pen, then adding color using color pencils. 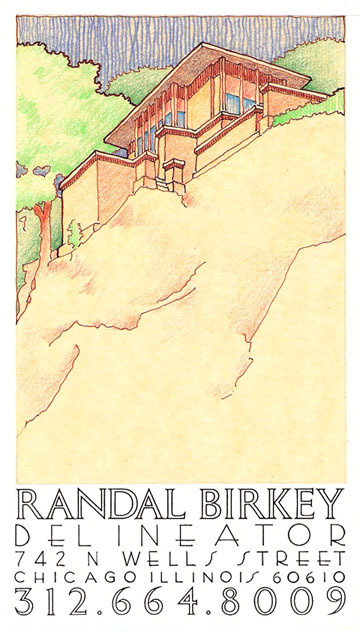 The image is based upon a Frank Lloyd Wright house drawing, designed for Thomas P. Hardy in Racine, Wisconsin. For a business card, the linework needed to be greatly simplified. I then selected a period style font and hand outlined the contact information for the card.